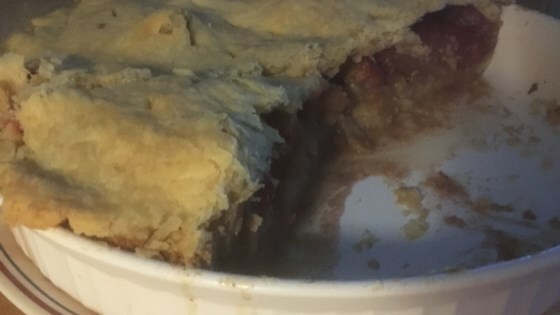 Recipe by: Amy D. H.
"A pie to remind you of early fall when the first apples are being harvested but fresh nectarines are still available at the market!" Preheat oven to 425 degrees F (220 degrees C). Grease a 9-inch deep-dish pie plate. Combine apple peels, white sugar, brown sugar, water, brandy, cinnamon, and vanilla extract in a saucepan; bring to a boil. Reduce temperature and simmer until fragrant, about 5 minutes. Remove apple peels with a fork. Roll 1 crust into a 12-inch circle; place in the prepared pie plate. Roll out second crust into a 10-inch circle. Cut a few slits in the center to vent steam. Mix corn muffin mix and milk in a bowl. Pour into pie plate. Bake in the preheated oven for 5 to 8 minutes. Remove from oven. Layer apple slices and nectarine slices on top. Pour sugar mixture slowly over fruit; cover with second crust. Press crusts together to seal; flute edges. Bake in the preheated oven for 10 minutes. Reduce heat to 350 degrees F (175 degrees C). Continue baking until top crust is golden brown, 35 to 45 minutes. Let cool to room temperature before slicing, about 1 hour. I used a mixture of Gala, Golden Supreme, and Empire apples. Save the skins for another use! Make sure the nectarines (white or yellow flesh) are still slightly firm. I prefer to use Kraken Black Spiced Rum® in this pie. Very delicious ??. Next time I will cut back the sugar a bit.